John Thorne from HTIA responds to patent litigation ‘industry’ insider Iancu (his clients may have included patent trolls), who wants to destroy the Patent Trial and Appeal Board (PTAB) and promote software patents. Remember that Facebook is a leading proponent of PTAB and backer of HTIA, whose main/sole function is supporting PTAB. 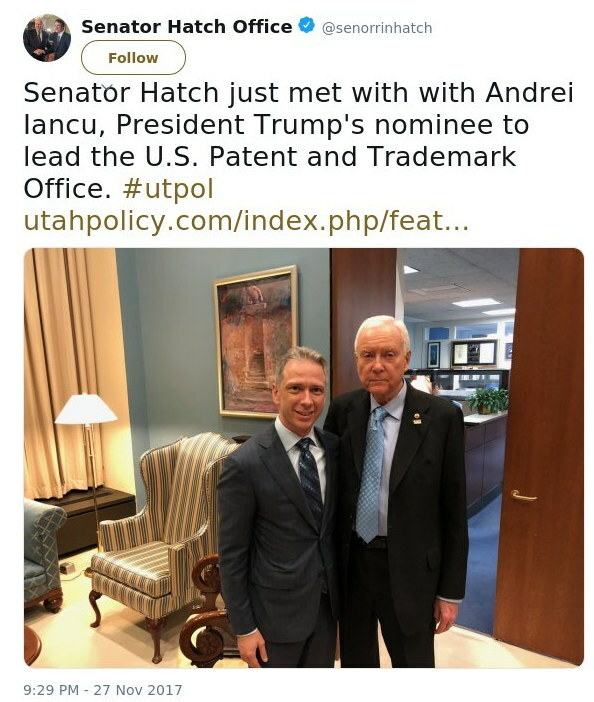 Last month, in a speech to the Intellectual Property Owners Association, the director of the Patent and Trademark Office, Andrei Iancu, challenged a fundamental feature of U.S. patent law, the U.S. Supreme Court’s 2014 ruling in Alice Corp. v. CLS International on Section 101 of the U.S. Patent Act. His criticism was mistaken. Section 101 defines what can be patented and, by implication, what cannot. In Alice, the court clarified what is not patentable. It held that using generic computer technology to computerize abstract ideas like business methods does not make the idea itself eligible for patenting. But if Mr. Iancu’s sentiments are translated into legislation, this line ensuring the quality of American patents will be blurred. American innovation will be stifled. In his speech, Mr. Iancu rightly called the American patent system a crown jewel. It is a jewel that must be preserved, not chipped away. Weakening Alice would only enrich patent trolls at a cost to ground-breaking technologies and the jobs they spawn. We must move forward to a future of continued innovation and economic growth, rather than backward to a past characterized by unneeded lawsuits, unnecessary costs and suppressed invention. Rather than stall technological progress, we must encourage it to flourish. Watchtroll pushes that same old “R&D” talking point. It’s a far-fetched lie that relies on efforts of actual companies, not the PAEs which do shakedown activities. Last week, the FTC held the fourth in its set of hearings focusing on “Competition and Consumer Protection in the 21st Century.” The first day focused on a review of the current landscape of intellectual property and competition. The second day featured a variety of panels focusing on the patent system, with panelists providing a wealth of important analysis. Key takeaways included the common opinion of a need for a pause in changes to patent law in order to provide time for the law to settle and the impacts to be fully understood. When reviewing evidence of the impact of the changes to date, the conclusion is that the impact has generally been positive and hasn’t impacted operating companies at all, while having a more targeted impact on the exact NPEs intended to be targeted by these changes. A few panelists tried to claim that the changes have had negative impacts, but did so either without any evidence or with false data. Finally, the fourth and last panel of the day noted that the patent system is a balancing act—too strong is just as bad as too weak. For more detail, you can read more detailed summaries of each panel below (and for much, much more detail, you can see my live-tweets of the conference. Prof. Frakes noted that we have some 19th century evidence they might, but that evidence may not apply to modern situations. Bessen presented some evidence that modern technological investment doesn’t diffuse down from the top the way it has historically, which might lead us to question the patent rights story. Initial innovations are important, but the innovations that follow on from those initial innovations, termed sequential or follow-on innovations, can have significantly more impact. Bessen pointed to evidence that PAE litigation reduces R&D expenditures. . He also noted that patents—especially in software areas—appear to reduce follow-on innovation. Prof. Frakes noted that the evidence for this varies by industry; while human gene patents don’t appear to have a meaningful impact—positive or negative—on follow-on innovation, software patents appear to have negative impact on follow-on innovations. In fact, he noted that one study found that in computers, communications, and medical devices, invalidation of patents tended to lead to increased follow-on innovation. Criticizing the Kilbride and AIPLA testimony, Prof. Gilbert noted that the panelists had said that ‘the world would fall apart without strong IP rights.’ But, as he noted, there is good evidence that post-eBay, the raised injunction standard hasn’t had a negative impact on innovation.